The tour guide greeted each guest with a Rastafarian smile and the gift of a marracha as he collected us at our hotels and gathered us into his gaily-colored bus. "Forget about the problems; forget about the stress," he urged with a slight Aruban accent. "You belong to Kukoo Kunuku now." As the bus whisked us away to the old lighthouse for a sunset Champaign toast, we, indeed, belonged to Kukoo Kunuku. No, this wasn't some off-beat Caribbean cult, it was a party bus, one of three that would soon cluster on a rise overlooking the northern coast of Aruba and begin an evening of madcap celebration. But the guide's admonition was too late. I no longer remembered my troubles. My wife and I had arrived on Aruba three days earlier and discovered traction is quite difficult on the small island. We soon lost our footing and slipped into a feeling of calm. It was much like being in a state of grace as the tropical air caressed us with gentle winds from the first moments after landing. On the second day we found the private island off the coast. A three-minute boat ride away, the cay was named Renaissance Island presumably because of the adult beach it nurtured. I must admit I discovered my own version of a Renaissance when the first golden beauty arose from her beach chair sans top and waded into the warm water to stand next to me. Now where was I... ah yes, the Kukoo Kunuku tour. After christening the lighthouse with a special brand of merriment, champagne provided by the hosts, we climbed aboard our buses and went on a "Mr. Toad's Wild Ride" around the town of Oranjestad. I had never done donuts in a bus in a parking lot before and I especially had never done them backwards. We landed somewhat dizzy (from the champagne and donuts) at the former Minister of Protocol's house for dinner and the rum tap was opened. Dinner was followed by three (or four) hours of bar hopping, including stage dancing to the Village People's obligatory YMCA song (always guaranteed to cut loose the macho tendencies of a young man). The humming buzz of Arubian electric air made time scream by. It was not too soon for many of us as we were bundled aboard the busses again and returned to our hotels. Somehow I missed my stop and it took a special trip to bring me back. At the time I felt like I was having the most enjoyable evening of my life but I'm sure this euphoria wasn't shared by the bus driver. It was one of my top-ten memorable experiences (right alongside swimming in crocodilian waters in Costa Rica and drinking Guinness in Ireland) but payment came due a few hours later when the sun popped his head through our hotel window. Luckily we had made our Mi Dushi snorkeling trip reservations for later in the afternoon and I had some time to recover. For boating enthusiasts, the Mi Dushi tour is a must. We chose the three-hour sunset sail over the five-hour day cruise and the experience was exhilarating aboard their 20-meter gaff-rigged ketch. For a 79-foot down winder, motoring is de rigueur against the brisk Aruban breezes but, when the sails do finally catch the wind, all is right with the world. I was taken aback by one lovely lady who walked up to me and asked how I liked Renaissance Island. "Did I see you there?" I replied. "I think you took my photo," she responded. "Don't you remember me? I waded into the water right next to you." Indeed I didn't recall such a thing I muttered to the lady as I made a quick exit over the side of the boat. I didn't want to miss exploring the sunken freighter just off our bow, now did I? Aruba was like that. A blur of greetings, some without faces. There were helicopter rides, scuba diving (a one-hour lesson and they turn you lose), kiteboarding, ATV's, horseback riding and excellent food, to name only a few more traditional activities. In addition to taking the Kukoo Kunuku tour and Mi Dushi sailing excursion, I recommend El Gaucho for the best Argentine grill north of the Equator and Driftwood for delicious, fresh seafood. But you probably wouldn't be able to go wrong even if you found a lesser-known restaurant and stayed close to your hotel. Everything we ate on the island was fresh and excellent. Our hotel had one special treat. Each day the bell would ring at 4:30 p.m. at the Renaissance Ocean Suites where we stayed, signaling happy hour by the pool. As guests waded up to the bar (for some odd reason reminding me of rutting elephant seals), they were greeted with a conveyer-belt delivery of island drinks and, of course, friendly smiles from Natalia, our bartender. The best thing about Aruba is you can easily forget your troubles and stress no matter what you do. In fact getting brain freeze on tropical drinks while listening to the hot blood of the island beat is my real excuse for not remembering the pretty girl's face on the private island. There could be no other explanation as far as I can see. While Aruba has had some negative press lately, the fact is the people are, arguably, among the kindest citizens of the Caribbean. Treatment of tourists on other islands sometimes amounts to churlish servitude but on One Happy Island, as the license plates proclaim, the locals will go out of their way to point you to where you can find rum at a cheaper price or will explain how taking the bus will only cost you a $1.25 but a cab will be $10. So, even without Renaissance Island, Aruba is a grand place to recharge. However, you might want to get your doctor's thumbs up before taking the Kukoo Kunuku tour. 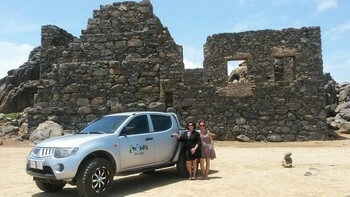 See Quality Tours Aruba invites you to discover Aruba with front row view. We love our gem of an island in the Caribbean and would also love to share our explorations and discoveries with you during a safe and comfortable tour. We appreciate your selecting us as your personal guide and look forward to your reservation. Let us show you the most gorgeous island in the Caribbean on a tour built around the real places of interest. We will show you the beautiful north coast of the island, Casibari Stones and Gardensm, stopping later for snorkeling and swimming at famous Baby Beach. Nearby San Nicolas, our second largest city, is where you will indulge in our Caribbean flavored Main Street and famous Charlie's Bar of San Nicolas. On this full day private tour we will also visit Seroe Colorado's Natural bridge, Guadirikiri Cave, Fontein, Boca Prins, the unusual Arikok Natural Park. These unique locations host many cultural, historic and natural hidden treasures. We will take you further than any other explore Aruba tours, with plenty of time for photo stops, attractions, and snorkeling. We provide the only the safest of tours; our guides will join you at our snorkeling locations to ensure you get the most out of your experience. Cold water, soft drinks, juice and fresh fruits.